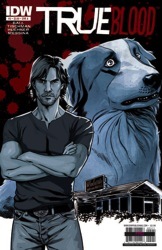 IDW Publishing and HBO have announced a second printing for True Blood #1. Due to popular demand, the first issue of the new comic book series sold out, but they are rushing to get more into stores by August 25th. “The passion fans have for True Blood has elevated the series to new heights and it continues to grow as the story unfolds,” states James Costos, VP Global Licensing and Retailing. 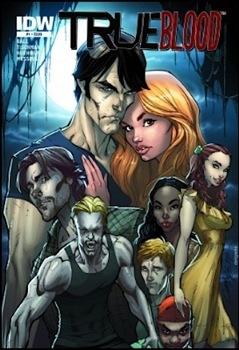 “With the sell-out success of the comic’s first printing, it is clear that there is an insatiable thirst for different iterations of the television series, and we’re excited to expand the impact of the comic series and get it into even more hands with this second printing.” The initial print run of True Blood #1 was an impressive 53,000 copies. Trapped inside the mystically-sealed Merlotte’s by a soul-sucking spirit, psychic waitress and vampire girlfriend Sookie Stackhouse is forced to reveal her deepest, most shameful secret to save the lives of Bill and her friends. But will Sookie’s shame be enough to satisfy the spirit, and does her story hold a surprise clue to the true cause of her parent’s death? Our untold tale from the world of HBO’s hit vampire series TRUE BLOOD continues. Story by series creator Alan Ball and show writers Elizabeth Finch & Kate Barnow! So was anyone able to get a copy of True Blood #1 before it sold out? Feel free to share your thoughts about it in the comments.